I don't know whether or not to think that maybe all this is a game to you ladies and gents over there... However, with a statement you made on Sunday June 16th, I have to wonder what on earth went through your minds when you stated this? 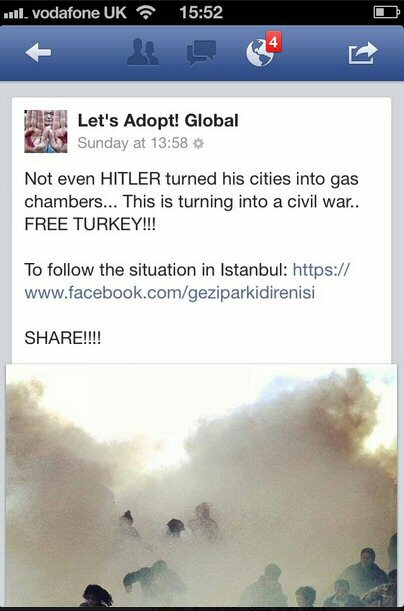 I'm just wondering how you can compare what is happening in Turkey to Hitler's Mass Genocide (Holocaust)? If Hitler didn't gas his people, then explain the concentration camps with the chambers for the Cyanide- mustard gas. Hitler's issue wasn't a civil war, I'll give you that one, but it was a WORLD WAR. What happened in Germany should never be repeated. What's happening in Turkey shouldn't happen either, but their policemen aren't using cyanide-mustard gas, now are they? Tear gas is non lethal and so is pepper spray. It is a crowd control method used even in prison. It is used against the people in getting them to back off. 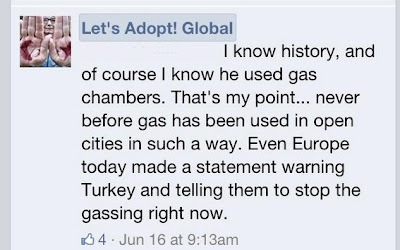 Hitler didn't gas his people? He just had soldiers shoot them in the streets, women, children and men who resisted the concentration camps, that had the gas there... Oh, and yes he did use gas in the streets. he also had soldiers who raped women and young teenage girls. Do you really want to compare this to Hitler still? Whom ever is posting at LAG seriously needs an education in our world's history. We whited out the name he or she responded too, that was their point? Never before? You're kidding right? Gas has been used in the cities, they did gas cities in Germany, you seriously need to get your facts together LAG. Not only did they use gas but military vehicles and guns against unarmed civilians. Would you like to continue this moronic statement LAG? I think you need to talk to the holocaust survivors and get their side of what has happened. You have not only insulted those who have survived, but those who have lost their lives in this tragic horrible event in history.